Your Complete Guide to Buying a UPS in Pakistan! Since loadshedding isn’t going anywhere any time soon, it’s best to acquire the right hardware to ensure long battery backups. Following our previous posts on calculating the right battery size and appropriate UPS rating, we have come up with all the details you need regarding UPS prices in Pakistan. It is pretty obvious that a UPS with higher power capacity and better output quality come at a higher price but the prices vary a lot in the market segment. 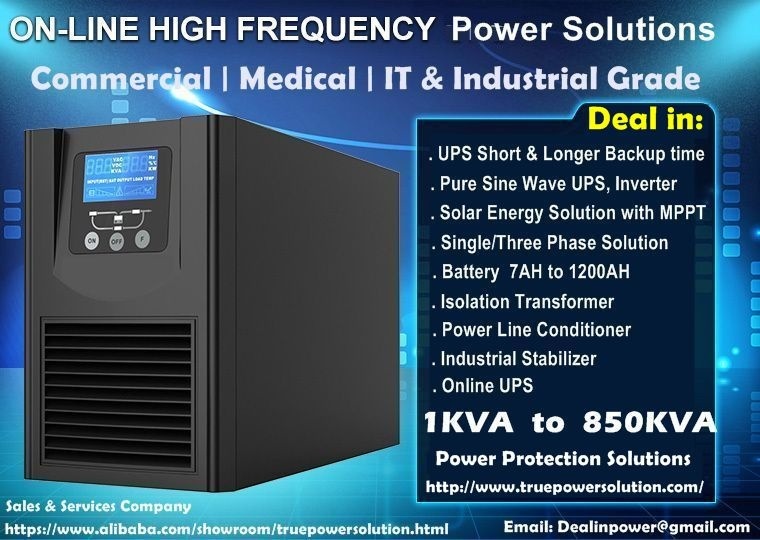 Inverters and UPS from local companies or Chinese manufacturers are generally cheaper while popular international brands charge you more for better quality and reliability. Now with that out of the way, let’s help you choose the right UPS for your needs and budget. In case you are looking for a UPS with a price tag of under Rs. 10,000, you should be expecting something that can support a couple of fans and bulbs at max. Choices are limited in this price range and those which are available cost around Rs. 8000 such as the Emerson Liebert 360W and EcoStar 300W UPS. If you are willing to spend Rs. 10,000, the EcoStar 600W UPS or Apollo’s 660W system can nearly double your maximum capacity. The price bracket between Rs. 10k-20k comes with the most number of choices. Many local and international companies offer multiple UPS variants with different features and capacities. Lesser known brands like NRE offer 1200KVA to 2KVA units with small price tags – around Rs. 11k-12k. These are the entry level units which do offer high capacities but the output quality is only average (modified sinewave). You might notice that the Rs. 20k-30k range has products that are similar to the ones seen in the cheaper price brackets. The maximum capacity is more or less the same but some of these do offer better quality output. UPS units offered in this range are from reliable and popular brands. These units can work at claimed capacities with high efficiencies of over 90%. Slightly cheaper models like Emerson’s 1000VA-1500VA, Hyundai 2000VA, EcoStar 1200W units are more or less comparable to the ones with price tags of over Rs. 18k. If you plan on getting a UPS from the world’s most popular brand, APC 700VA is also an option. Of course, APC UPS don’t offer good value for money in a country like Pakistan. These offer pure sinewave’s (high quality output) with plenty of features. Most cheap brands and local companies do not sell high rating UPS which can work with extraordinary loads. You can only get imported units from China or other markets. 3000VA units from Homage, Inverex, ProLink, Crown Micro are available for over Rs. 35k. These come with high quality output or the option of Solar Panel support. Axpert offers a 2KVA unit for the same price though. Since most users don’t go for UPS with capacities of over 3000VA, we have merged them all in a single category. Only people who want to run offices or ACs on their UPS would spend this much on one. 3000VA units from Homage or Inverex come with high quality outputs and solar support. Price is often close to Rs. 50k. 1000VA APC unit also falls within this price range. Single unit UPS units from Emerson come in at around Rs. 70k for 3000VA but these are targeted towards office use. If you want to opt for bigger 5000VA units, Homage, Inverex and Aurora offer UPS with prices between Rs. 70k to Rs. 80k. If you are willing to spend even more, imported brands offer UPS with ratings of over 6KVA, 10KVA and more. These units start at around Rs. 110k and go up to Rs. 300k. For large scale offices, Rs. 1 million 30kVA units might be a good option. Note: Please do note that the rates mentioned here might vary a bit from existing market rates depending on city, demand and seller’s choice. Good Information. Thanks a lot. The way of writing is very good in deed. Who in pakistan is giving a 1200KVA UPS? Generator is Best ! Na Charge Karni Ki Fiker Na Kuch ! Pure Ghar Ka LOAD Dhalte Hai Itna to Generator Ka Bhi Haq Hai ! Bhai Faisalabadein to sirf 2 hours ki load shedding hai. May be due to excellent recovery rate of fresco. UPS is working great here. rat ko sote waqt light chali jye phir? kon start krega genarator.,i hv both ups plus generator. @Propk Admin, This site forced me to disable AdBlocker, and now Propk is full of shamefull pictures. Wtf is wrong with you guys. I usually visit the site from my office. If servers are expensive to host, then better hire good writers to attract crowd. Ps. I don’t search such illegal contents nor I visit such sites. This is the first time i saw such material on my system. remove it completely or manually select acceptable view-able ads. You do know what AD Tracking is based on your browsing history by Google. It would only serve you ads for things you have shown interest in. Seriously when would you guys understand the simple concept that ProPK has got nothing to do on the ADSENSE which is implemented. The AD Window contains no web code only Google code. Can’t blame the web for your actions or can you. EcoStar has complete product line from 750 Watts till 10,000 Watts. I have got 3000 Watts EcoStar UPS installed at my home. Its a DWP Group product which also distributes Gree. Systek has been engineering Power Solutions for the last 25 Years for Corporate Organizations of Pakistan on national basis. We are one of the very few companies in Pakistan engaged in indigenous design, development and manufacturing of power protections products, such as UPS’s, Line Conditioners Single and Three Phase, Solar Hybrid UPS’s, Solar MPPT Charge Controller, Solar VFD Pump Drive etc, besides other electronics products that are comparable to reputed international brands. Being an R&D based company, Systek has designed and produced many custom-made products and completed many special projects for various organizations in the public and private sector. It welcomes queries and opportunities to design and developed products and engages in projects pertaining to its areas of expertise. We are one of the only manufacturers of UPS and other products mentioned above, supplying quality products and services all over Pakistan and striving to serve even better in the public and private sector. We would be pleased if Systek (Pvt.) Ltd., will also be enlisted as a supplier of your esteemed bank. In this connection related documents are attached herewith for your kind perusal and favorable action. Systek is the only manufacturer in Pakistan producing Sine wave Line Interactive UPS up to 8.0 kVA, No body knows power problems better than Systek, as Systek products are made by Pakistanis in Pakistan for Pakistan. It has offices in three major cities Karachi, Lahore and Islamabad and a Dealers Network pan Pakistan. It gives the best solution of your power problems. Hence, Systek is the best value for money! Systek has the largest team of engineers / technical team members in its sales, support, production and R & D department. Feel free to ask about Systek, its products and the pros and cons to buy a Pakistan product, specially Systek Products.